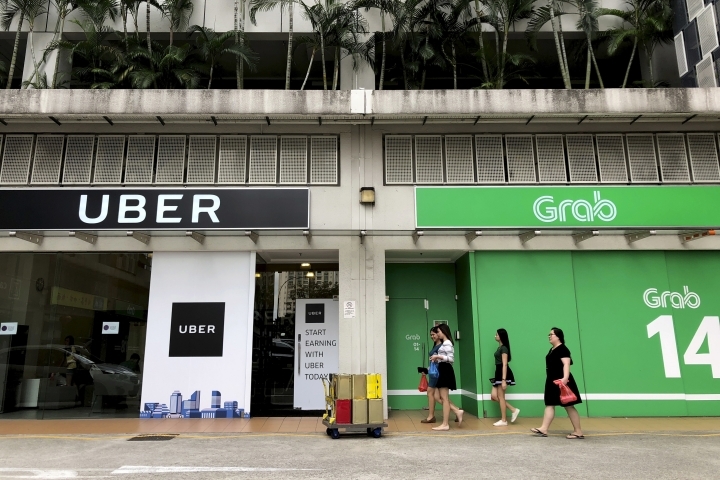 SINGAPORE — Singapore's competition watchdog has fined ride-hailing giant Uber and its regional rival Grab 13 million Singapore dollars ($9.5 million) for a merger in Southeast Asia that the agency says has driven up fares and reduced competition in the market. The Competition and Consumer Commission of Singapore said Monday that Uber's sale of its regional business to Grab in March violated the Competition Act. As part of the deal, Uber took a 27.5 percent stake in Grab, a fast-growing Southeast Asian ridesharing, food delivery and financial services business, and was given a seat on its board. Grab holds an 80 percent market share after the merger, which caused fares to rise by 10-15 percent, the watchdog said. "The transaction has led to a substantial lessening of competition in the provision of ride-hailing platform services in Singapore," it added. Uber was ordered to pay a 6.6 million Singapore dollar ($4.8 million) fine, while Grab was fined 6.4 million Singapore dollars ($4.7 million). The commission said the fines were meant to "deter completed, irreversible mergers that harm competition." The company has been ordered to use pre-merger algorithms for pricing and driver commission rates. It has also been asked to stop making exclusive contracts with drivers and taxi companies. Lim Kell Jay, the Head of Grab Singapore, said the watchdog had used "a very narrow market definition in arriving at its conclusion." He denied that fares have been raised. "Grab completed the transaction within its legal rights, and still maintains we did not intentionally or negligently breach competition laws," he said.